I’m really impressed with what Think Tank have created in their Streetwalker backpack series. The Streetwalker Pro in particular is the perfect bag for my setup – holding an incredible amount of gear in what on the outside, looks like a fairly small and nondescript backpack. I also really like the Think Tank Lens Changer bags. When I’m in walk and shoot mode – I use a Lens Changer 50, Lens Changer 75 Pop Down, Skin Strobe and an R U Thirsty water bottle bag – all attached to my Yates 1.75 inch Cobra CQB Belt. The belt wears just like an ordinary belt. And with a flannel short sleeve shirt covering the Skin Strobe at the back – it doesn’t actually ‘look’ like I’m carrying that much gear. 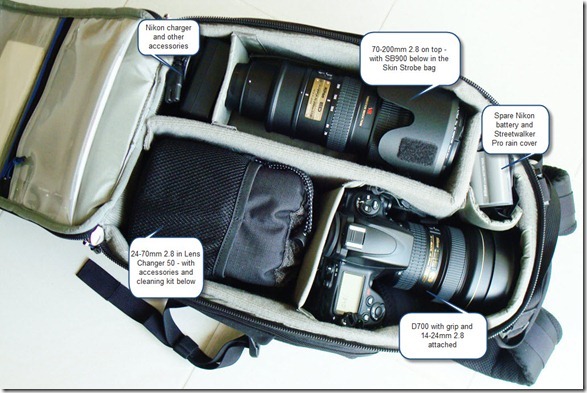 Here’s one configuration that I use for the Streetwalker Pro (click on the images for large size). A pro body with three pro lenses, a flash, accessories and a tripod. The Streetwalker Pro copes with it all brilliantly and is extremely comfortable to wear. There’s also a deep groove down the back and lumbar padding – which lets air in, keeping your back cooler than a flat padded backpack would. Think Tank really pay attention to detail as well. With the backpack and a few lens changers – all the rain covers are clearly labelled – so you know which rain cover to grab in a hurry to get your gear covered when you need to. 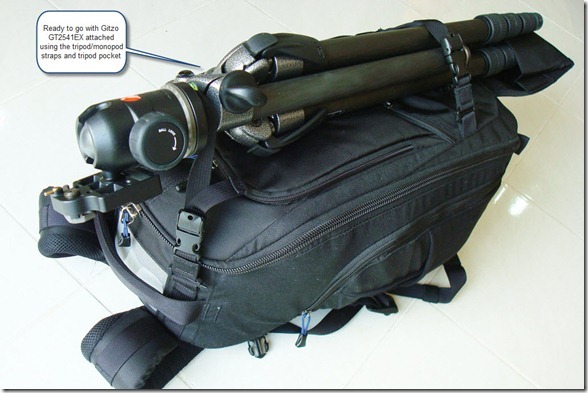 My only minor gripe – is that I wish they’d placed a cross strap just above the side pockets – one on either side – so that I could attach a Lens Changer bag to the side of the Streetwalker Pro for a little extra storage when needed. 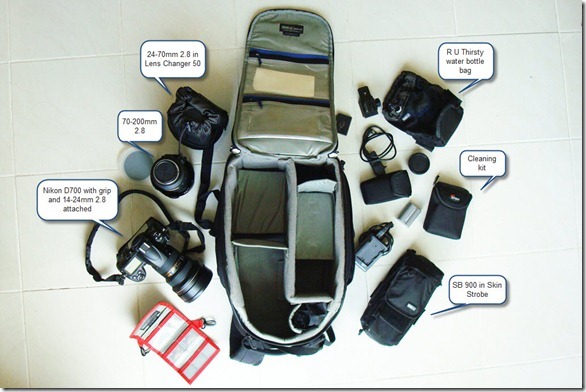 I am so fed up with my current camera bag. This backpack looks perfect: it holds everything you need, and travels easily. Thanks for the info!